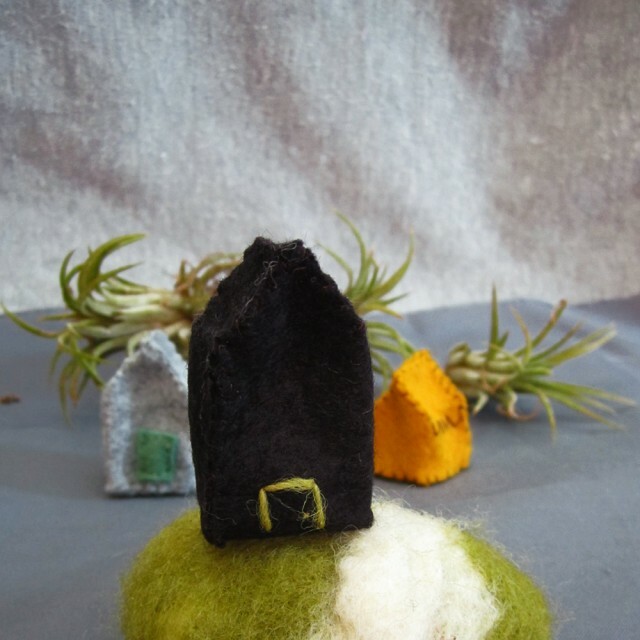 I made a wee house to nestle between two books on my shelf and decided that a sprinkling of wee houses is just what I needed to spruce things up a little in time for the coming spring. It feels a little bit like Iâ€™m inviting some of those happy little spring spirits into my rooms. I hope they bring some fresh air and happy colors with them if they do decide to move in! Download and print the patterns from this link here (note, you will need Adobe Reader to view the pattern). Cut out each house along the dotted lines. 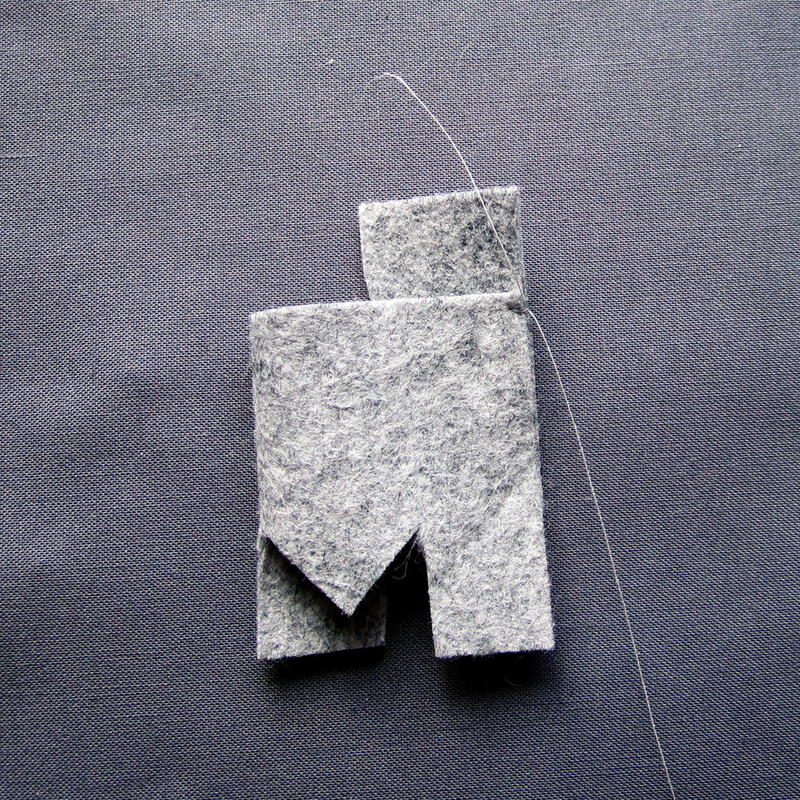 Place the pattern on your piece of felt. Iâ€™ve found that using an x-acto knife and ruler is better than scissors for cutting out such tiny patterns. Use your scissors to clean up any stray tufts of wool left over from the cutting process (especially in the corners next to the triangles). Now, itâ€™s time to sew! With wrong sides together, match the asterisks to each other. Sew through the asterisks once and tie a square knot. Using a ladder stitch, begin to stitch up from the asterisk to point â€œaâ€. Match the â€œbâ€ points together. Stitch up the peak of the house. Once you get to the peak, match point â€œbiâ€ to â€œbâ€ and stitch down to the corner. Tie a square knot and pass the needle into the interior of the house through the corner and back up to the peak of the house at point â€œbâ€. 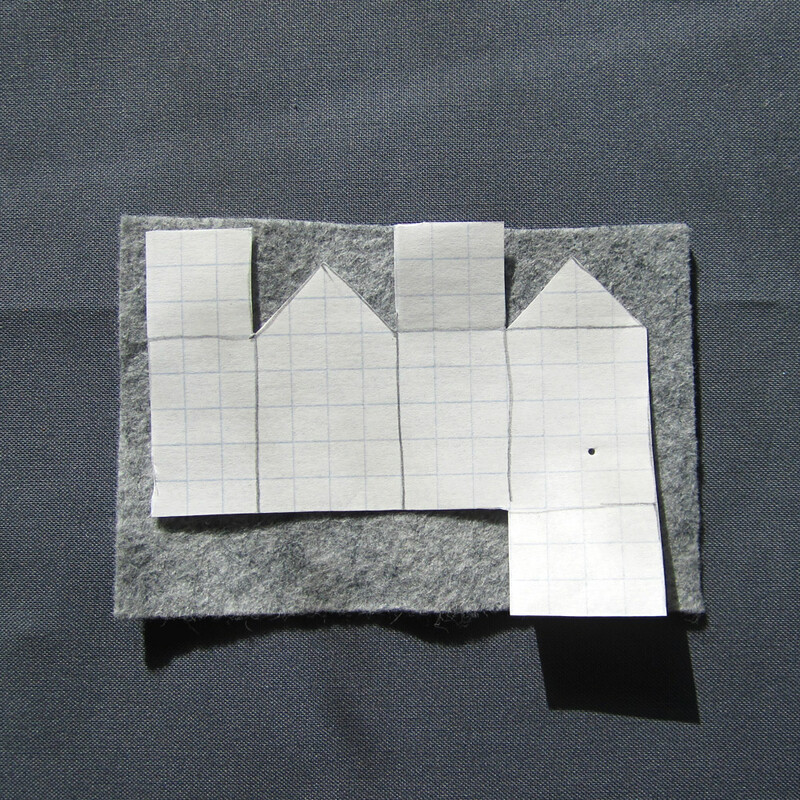 Resume ladder stitch across the peak of the house, sewing the two sides of the roof together from point â€œbâ€ to point â€œcâ€. Continue down one side of the second peak to the bottom corner of the roof. Tie a square knot and thread the needle into the interior of the house and then back up to the peak at â€œcâ€. Stitch down the other side of the peak to the remaining corner. Tie a square knot and thread the tail into the interior of the house. Snip the thread. Now itâ€™s time to attach the floor. Beginning at the asterisk, tie another square knot just as you did in the first step. Match points â€œfâ€ together and stitch the first wall and floor sides together using your trusty ladder stitch. Turn the corner at point â€œfâ€ and stitch along the next side until points â€œeâ€ match up. Turn the last corner and stitch up the remaining side. Tie a square knot, thread the needle toward the inside and out through a wall. 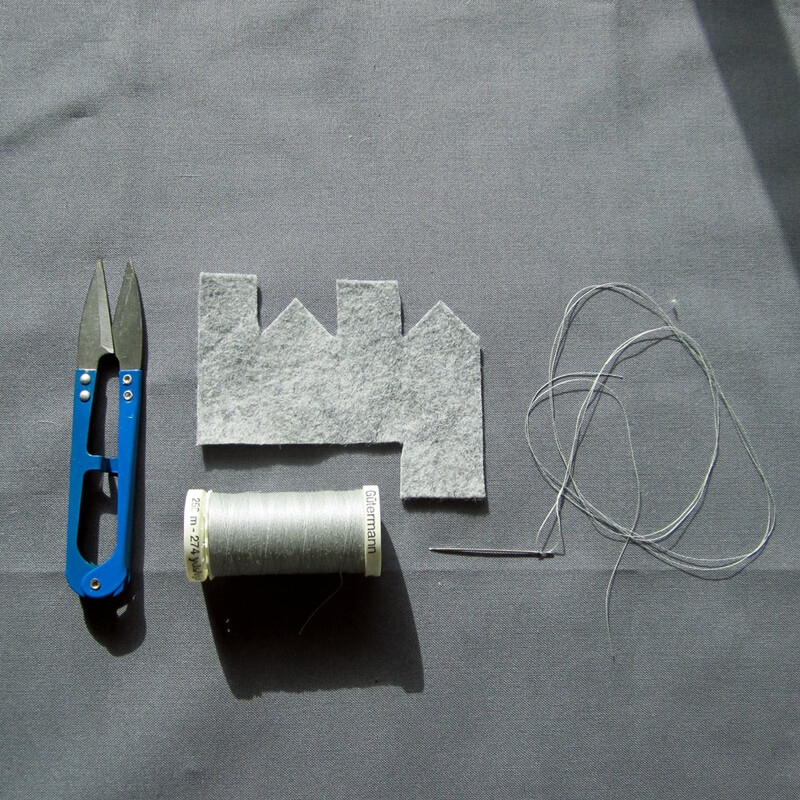 Snip the thread flush with the outer wall and gently shape the house with your fingers until it is the desired shape. Ta dah! A delightful little house, ready to tuck into any old unsuspecting corner you might have lurking about. These house are really quite tiny. The taller "townie" version is 1.75 x .75 x 1 inches and the smaller "country" version is a wee 1 x 1.25 x .75 inches. 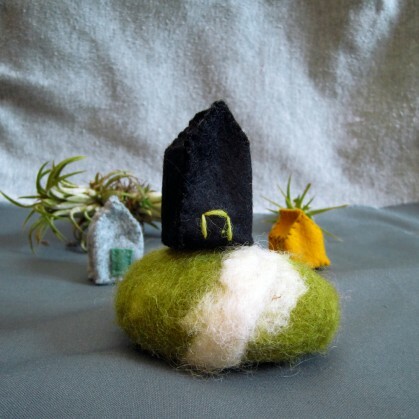 Oh, there are so many fun things you could try with these little houses to spice things up. You could embroider a little door, sew a felt door on, embroider some interesting patterns on the roof, stuff with wool to make everything extra sturdy.... oh the choices! If you choose to add some details to the outside, it might be a good idea to do so after you cut the pattern out but before you start sewing edges together. Also, a note on felt. I've found that using 100% wool felt tends to be thicker and a bit sturdier. That being said, if you've got a blend lying around that's just calling to be made into happy little houses, then by all means, stitch it up!